Can I put a stock pot underneath this food mill? A stock pot of no higher than 15 1/2" can be placed underneath the food mil. 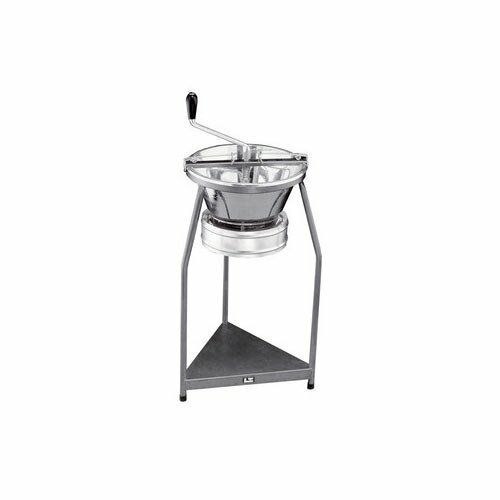 This Tellier P10 15 1/2" diameter tin-plated food mill has an output of approximately 22 lb. per minute, suitable for a busy restaurant serving up to 200 guests! Simply place cooked fruits or vegetables in this mill, turn the crank, and the semi-circular blade sweeps, compresses, and scrapes products to strain and puree them to a smooth consistency. This mill comes with your choice of sieve, ideal for general mashing, purees and soups. Plus, its handy stand allows you to place a receptacle directly beneath the food mill!